Explanation: Open clusters of stars can be near or far, young or old, and diffuse or compact. 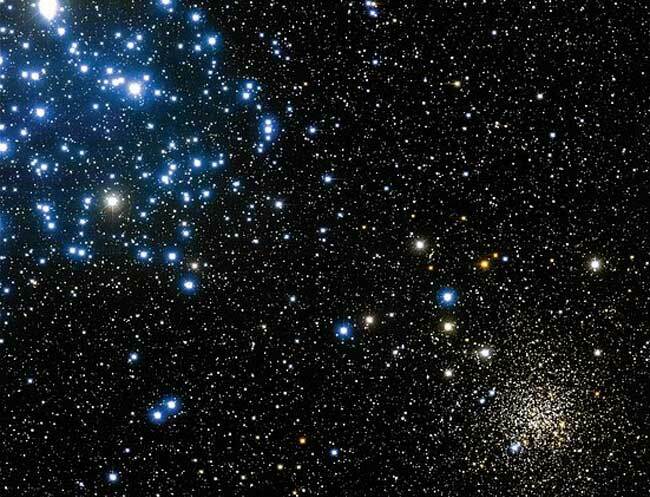 Open clusters may contain from 100 to 10,000 stars, all of which formed at nearly the same time. Bright blue stars frequently distinguish younger open clusters. M35, pictured above on the upper left, is a relatively nearby at 2800 light years distant, relatively young at 150 million years old, and relatively diffuse, with about 2500 stars spread out over a volume 30 light years across. An older and more compact open cluster, NGC 2158, is visible above on the lower right. NGC 2158 is four times more distant that M35, over 10 times older, and much more compact as it contains many more stars in roughly the same volume of space. NGC 2158's bright blue stars have self-destructed, leaving cluster light to be dominated by older and yellower stars. Both clusters are visible toward the constellation of Gemini -- M35 with binoculars and NGC 2158 with a small telescope.